Andrew McMahon explains why his new Wilderness project is the most focused thing he’s done in years, touches on the themes of storytelling and fatherhood, and unpacks his lifelong obsessions with dreams and the sky. How do you like living back in South County again? Oh, I love it. It’s home for me. I actually really liked living in L.A. It was fun. It just kind of got to the point where I missed the beach too much. More of my friends are back there, so it just made more sense to go home. But yeah, I love it. I think it’s probably a little better place to raise a family, too. Yeah, that’s a factor. It’s funny. We moved back three years ago. I think in general with the way I work, it’s tough when I lived two minutes from the studio. I would just bog myself down. Now it’s more focused where I’m not in that mess of the industry capital of the world, do you know what I mean? So one of the things you did with this album, which a lot of people are doing now, is you released a number of songs beforehand, so there’s four songs out there that come with the pre-order. How do you like releasing an album as a piecemeal rather than all at once? It’s interesting. I’ve done that with so many of my records at this point. Even back with Glass Passenger, we put out EPs of the songs for the months leading up to the record. Truthfully, with those kinds of things for the most part, releasing a record is hard enough as it is these days. I get in line with the idea of whoever’s marketing the record. Whoever we brought in to market the record, I’m just going to have to trust them to find the best route to putting it out. I actually really liked, for the fact that we were on tour for the summer, to be in a position where some of these songs were coming out ahead of time. So we would be playing them live and getting people excited about them. I think it’s been really effective. It’s certainly a nice way to introduce people to the project without having one flash of an album out, and then it comes and goes. It made it more of an event it seems like. When you first announced this record, I know a lot of people were curious as to why the “in the Wilderness” is attached to your name. Can you talk about that and if this is something just for this record or something you see continuing forward? That’s a good question. I try to take all these things as one record at a time, and in general I take life one day at a time. For me, the “in the Wilderness” name came from getting out of the major label system and into working on records on my own and taking control of some of the properties that had otherwise been tended to by the employees of the record company. A lot of it for me was being in this position where you have a lot of rope to hang yourself with. It became this experiment of getting in rooms with different people and really doing a lot to put myself in uncomfortable situations to see how I could grow in my writing process and my production process, and even the marketing and the release strategies. For me, that was the wilderness. That was my abstract wilderness, to sort of find a way through a new version of the record business and a new version of writing and recording and releasing a record. I can see sticking with it for a couple albums, but as of now it speaks well for this catalogue. If nothing else, it will be good for this album. With this record, you had a little bit of a different writing process where you tried to keep the work and home apart as much as possible, and you did a lot of stuff out in Topanga Canyon. How did you like doing that and how did it compare to writing on Jack’s last couple albums? I think there was a lot more focus involved, not only in the work for the record but in my personal life. The two previous Jack’s albums, they’re records that took a few years to make. A lot of that had to due with the fact that I was always juggling multiple things, my personal life with working in the studio, and also with touring and being on the road. Not having the ability to just focus on the writing process alone, I don’t know if it was a detriment to those records, but it was certainly a detriment to finishing them in any sort of reasonable amount of time to get music out. The approach was a lot different. Certainly knowing there was a baby coming and that there were a lot of things I would need to be available for at home, we made the choice to really compartmentalize and make the writing and the record its own world and make home and my personal life its own world. Chiefly, I feel like it’s one of the most focused things I’ve done in a long time as a result. I really enjoyed it. As far as stylistically, one of the major departures on this record than what you’ve done in the past is there’s pretty much no guitar on it. I think there’s a little bit of guitar on “Black and White Movies,” and that’s it. How did you like doing more with just keys and electronics? What did that allow you to explore? It didn’t start off as this conscious idea, but as we were beginning to write and demo some of the songs, Mike and I in the studio, there just became this moment of space that I hadn’t expected I would get from leaving so much out and freeing all this space for the vocal and the piano. I really wanted my piano parts to be fleshed out and be really important to the record. I wanted to paint with some different sounds and pull from a combination of soundscapes, both contemporary and classic. I just felt like this, now more than ever, because I didn’t have necessarily a band I was focused on propping up in the album itself. It gave me a chance to say, “Well, let’s paint with some different colors.” I enjoyed it. I never felt like it was wanting for more. I think it did give us a nice amount of space and a little bit more of an open sound than we’ve had. On the last couple Jack’s records, they’re so layered. There’s so much sound that I think it made it possible to make this solo record more focused sonically. The live lineup is still three-fourths of Jack’s Mannequin but you’re doing reinterpretations of some of the old songs, including a really cool slowed down version of “The Mixed Tape.” Even though it’s the same guys and stuff, how different or similar does it feel to your live shows in the past? Certainly Bobby, my dear friend who was my guitar player and played in Something Corporate and throughout Jack’s, playing with him onstage and having him to interpret those songs on the guitar – it’s clearly a much different thing when we do them without a guitar. What we ended up finding is the songs still have this bigness. In a lot of these songs me, Mikey and Jay are still playing what we would have been playing on any of the Jack’s songs, and obviously on some of the Something Corporate stuff too, but again it had the same effect of leaving the guitar off on the record. It allowed for a lot more space. We ended up really working on harmonies and background vocals, trying to fill those gaps with whatever we had at our disposal. I can’t say that I don’t miss it sometimes, but most times I’m like, wow, this feels great. There’s so much space. When I’m onstage listening, I feel so energized by some of the new arrangements. It’s different, but I don’t feel like it’s a loss. With these new songs, I noticed there’s a big storytelling aspect to a lot of them, especially on something like “Canyon Moon” or “All Our Lives.” How much of that side of things did you want to tap into on this record? I think it was important for me, especially because this is the first full-length record that I’m really putting my name on. Obviously, I’ve been doing this for a long time, and have a lot of amazing fans and people who have listened to me for years. But I wanted for this first outing as a solo artist to focus on the storytelling, to make the songs really visual and try and take people into the space that I was when I was writing them or into the theme of the story that I was trying to tell. It was very conscious to not be vague on this record, to make people want to know what happened to the people in these stories and to make people feel like they were in that moment and in that space with the characters that are represented in the songs. It was a very conscious choice to do so. On “All Our Lives,” there’s the first verse about the guy you meet in the bar and the second verse there’s the woman that’s driving. Was that completely fictionalized or was that pulled from real life? No, they’re literally all real stories and stuff that happened within a couple days. I had run into an old friend who played music, and still does, but who really had a tough go with drugs and definitely fucked his life up in a big way. I sort of took it as a cautionary tale. Obviously, this is an easy business to have a lot of fun every night of the week if you choose to. I’m certainly no saint when it comes to that stuff, but seeing somebody hit so hard by it gives you pause. It just so happened I had this writing session scheduled the next day after this meeting. I said, “I want to talk about this. I want to try and talk about these people who, even through their own mistakes, you can end up learning a lot from.” In that sense, they’re sort of protectors. It’s kind of the opposite. It’s not someone who necessarily clears the path for you. They are protecting you by leading a bad example, if that makes sense. That was definitely a real thing that happened. I was really struck too by the woman’s story. You close that verse out talking about your two mistakes, running from the people that love me best and trying to fix a world that I can’t change. How much is that pulled from your life and what you’ve learned from? For me, it hits close to home for sure, like a lot of this record if you really dig into the meat of it. This was sort of the last piece of the puzzle in what were these recovery records. I always think of the last two Jack’s Mannequin records as these different stages of getting through the whole illness thing and everything that went along with it. This record is much more about being back on my feet and having perspective from those years and taking a good look at the life I lived. Granted, a lot of it was hard to really even be conscious for, because it was kind of a messy time. When you get to lines like that and pieces of these stories that are in these songs, there are some moments of reflection where I can say some of these things. I’ve definitely made a good amount of mistakes in my life, and I’ve tried my best in recent years to learn from them. That was definitely a vulnerable moment on the album. It’s a combination. When you start a project, you can’t pigeonhole yourself. The Topanga outing took up the first couple of months of the hatching process of the record. A lot of the themes were born out of that moment, but I think it was still hard to totally put my finger on it. A lot of songs got written or half-written for the album, and I don’t think it was until the months leading up to going into do the recording where all of a sudden it became very clear. I think “Cecilia” was a pretty pivotal moment. When that song was written, all of a sudden it made songs like “See Her on the Weekend” make a lot of sense, and songs like “High Dive” and “Halls” make a lot of sense. Another of the things you do differently on this album is there are different vocal effects and things that you do with your voice that you haven’t done too much of in the past, which adds this wistful or dreamlike quality to some of the songs. What were your intentions with playing around with that? When I write a record, I’m listening to other records. I really believe that being active and listening to music, and following your contemporaries and your peers, seeing what’s available sonically when you’re making a record, is really valuable. Down to some of the programming and vocal effects and things, these are contemporary devices that are popping up in records. One of the things that stands out in looking at the catalogue of music that you’ve done is you write about dreams a lot, and that pops up a fair amount on this record. Why do you think you keep going back to that subject? Are you the type of person who can remember your dreams and music comes to you in dreams? [Laughs] That’s a good question. I think it’s a combination. I am not a strong sleeper. I never have been. That’s one of the hardest things for me to do, is get a full night’s sleep, so maybe if anything I’m wanting for more dreams. That said, I definitely do have creative dreams. I do have a lot of moments where I wake up with my phone or a notepad and take notes, and I’ll bring those into the studio. “Driving Through a Dream” was this sort of meditation where you wake up in the middle of the night, maybe a little overwhelmed by something that’s coming. You have some fear or some anxiety, and you’re trying to ride that out with the person next to you. That’s where that song came from. Truthfully, it’s not something I do consciously. I tend to find with themes like the water, and the sky and dreams, these sorts of more ethereal things that pop up in my songs, they just get filed in the category of muse or something. They’re this fertile ground that no matter what I do, I can’t avoid those subjects somehow. You brought up one of the other things I wanted to ask about, which is the sky. I remember that from the old Something Corporate songs like “Watch the Sky,” and then you’re always bringing in these astronomical references of satellites or telescopes or moons. Totally. That goes back to early childhood for me. I was always obsessed with the sky and the stars. I always had these crazy dreams where I was floating in space, and I still do. A pretty common recurring dream for me is this lost in space kind of vibe. There are some days where that’s an anxious thing, and there are other days where it feels really good to be out there. I think a reason that theme finds a way into a lot of my music is because it represents something that on one hand is really freeing, but on another can be really scary. That’s a theme that’s followed me through my whole life as a result. One of the cool things you did this summer was you had that one show where you played Everything in Transit in full. How did you like doing that? The 10-year anniversary of that record is coming up next year. Have you given any thought to doing something special to celebrate? Yeah, absolutely. It’s a pretty well known fact that’s one of my favorite records I’ve ever worked on. Certainly getting to that 10-year mark is something I’d like to find a way to celebrate and bring to fans. There’s nothing officially on the books at this point, but I would anticipate that there will be some celebration carved out, both live and hopefully with the rerelease of the vinyl, that fans can expect. You have this fall headlining tour coming up next. Do you have anything planned for next year yet? At this moment, the focus has really been the fall and working the single as hard as we can. We’ll probably be doing shows through December, and then I imagine in the new year we’ll gear up for some international touring and get the record released overseas. I thought it would be cool to close on one of the quotes you’ve been saying about this album, which I thought was really interesting. You said, “Music is a mirror to the adventure of living.” I was wondering if you could talk about how that has reflected throughout the years for you. For me, I’ve always used music as a way to chronicle each stage of life and these little adventures I’m lucky enough to get to go on. I love that about having these records. Even when you stumble, or you do a song that’s not your favorite song or you end up exposing yourself in a way that maybe you’re not always excited about, it becomes this scrapbook or photo album of the life that you live. I know everybody writes from a different place. I’ve just always chosen to write primarily from a position of autobiography. I really try to write myself into my songs, so I have this scrapbook. For me, that’s what has always attracted me to music. Most of the artists that I celebrate and listen to regularly are people who write that style of music. It certainly seems to be my way. Watch the first episode of a new video series from Andrew. Craig Manning reviews 'Upside Down Flowers,' the third LP from Andrew McMahon in the Wilderness. 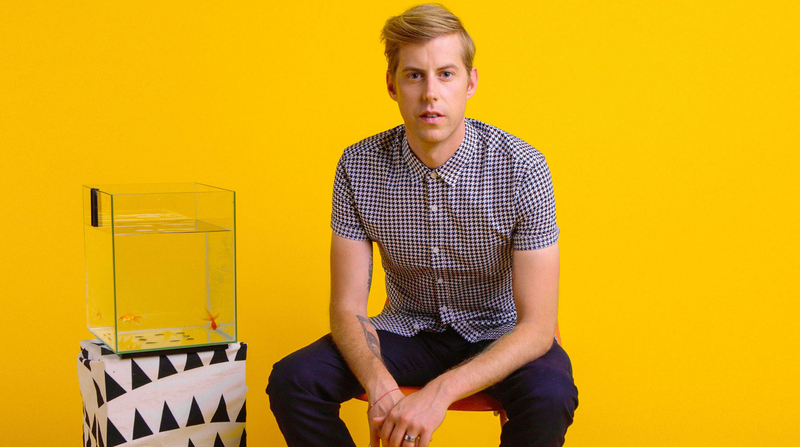 Hear a new song from Andrew McMahon.